When it comes to indoor bike storage ideas, there is no one best bike storage solution as it really depends on your individual living arrangement. Finding small space bike storage ideas that are ideal for you it depends on a variety of factors such as how many bikes you must store, how heavy the bike is, how much space you have and whether you’re looking for a permanent or non-permanent solution. Once you start to consider these factors you will be one step closer to no longer tripping over your bike! 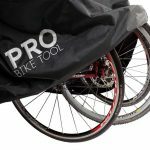 If you need help working out what are the best bike storage solutions for you, then you are in the right place because this is a complete and comprehensive guide on the best indoor bike storage for small spaces (check out my guide to outdoor bike storage here). In this guide, I am not only going to take you through the various bicycle storage solutions available, but I will help you choose which is the best indoor bicycle storage system for you. Once you’ve considered all the bike storage systems and decided which is the best way to store a bike for you, I will take you through the various products currently available. 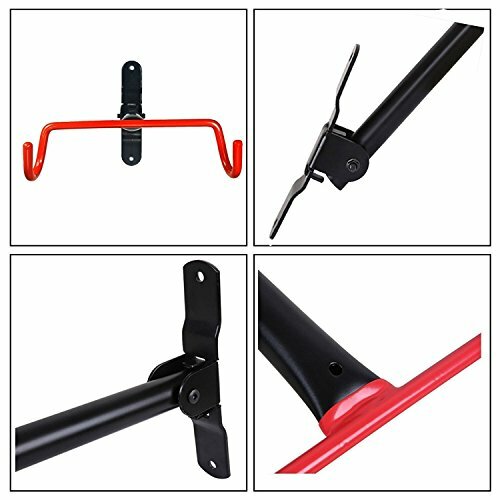 In this home bike storage guide, I look closely at a variety of products such as bicycle storage racks (both vertical bike racks and horizontal bike storage options), bike hanger hooks, free-standing bike racks as well as both ceiling bike rack options and options to hang bikes on the wall. 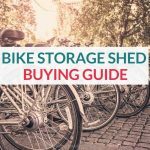 Regardless of your situation, I have no doubt you will find the best way to store bicycles for you in this guide. Whether you are looking for apartment bike storage, kids bike storage ideas or just indoor bike storage, in general, there is an answer for you in this guide. 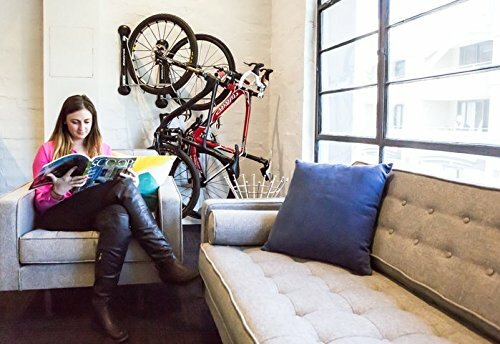 Don’t have time to read the entire bike storage for apartments and other small spaces guide? Below is a table listing out the various efficient bike storage solutions featured in this article. You can quickly see the different products and compare their features side by side. For more information about these products keep reading the full reviews below. Like anything, there is no one size fits all when it comes to bike storage for small apartments and homes. So regardless of whether your short on floor space, wall space or even both, there is the perfect bike storage solution for your home. I’ve split the various bike storage options between permanent fixtures (requires attaching to wall or ceiling) and non-permanent fixtures (not required to fix to wall or ceiling). A horizontal wall bike rack is perfect in small spaces where whilst there may be not a lot of space on the floor, there is ample of wall space. Essentially a horizontal wall mount bike rack is bolted to the wall and the bike is hooked on to it underneath the top tube, so the bike fits nice and flush with the wall. You can also get some horizontal folding bike storage, which folds down when not in use. A vertical bike rack or vertical wall bike hook stores a store bikes by holding the bike by a single wheel. A vertical bike storage rack or hook gets screwed into the wall or ceiling beam and is a relatively inexpensive way to store your bike. 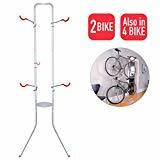 They’re also great if you’re looking for a 2-bike storage rack, or even 3 bike storage rack, in fact many bike stores use vertical racks to display their bikes. 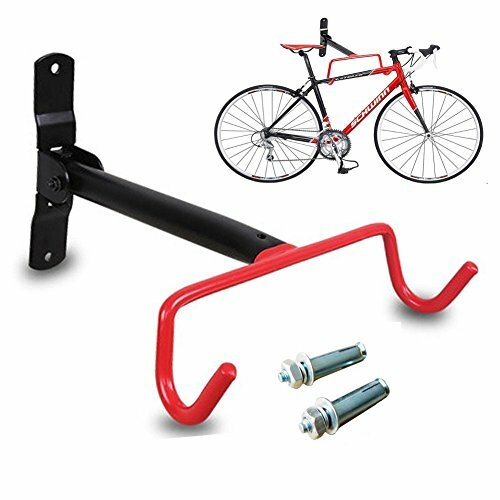 Apart from the simple bike hanging hooks, a vertical bike hanger also come in a more secure option which has a large backing plate which fixes to the wall at several points. 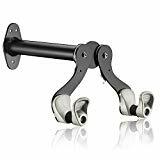 Using a vertical bike rack wall mount like this means your bike is securely fastened rather than swinging around like it would on one of the simple bicycle hanging hooks. Vertical hooks and racks are best used for small spaces where you don’t really have the space width wise but are ok depth wise. If you’re wondering what the best way to store a bike in an apartment or home where you don’t have floor or wall space, then you will be happy to know there is even ceiling bike storage. 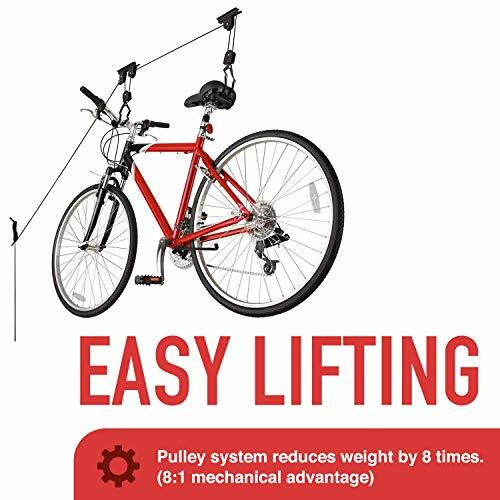 A bike ceiling hanger system is a hoist system which is secured to your ceiling and is often used for a range of things such as ladders and kayaks. To hang bike from ceiling with a hoist system, it does take a little more time in terms of both installation and retrieving your bike whenever you need it. 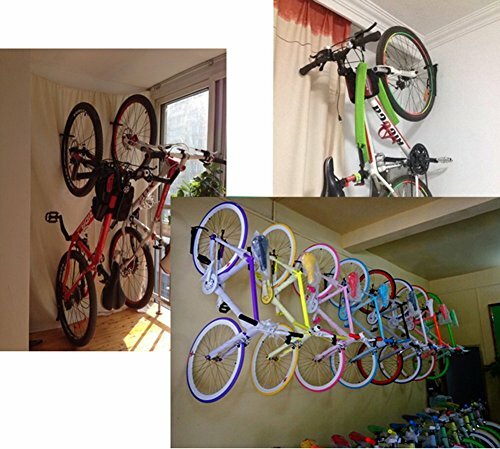 If you’re wondering how to store a bike in an apartment or small home your renting, and so can’t fix something permanently to the wall, then a ceiling to floor rack is the ideal choice. 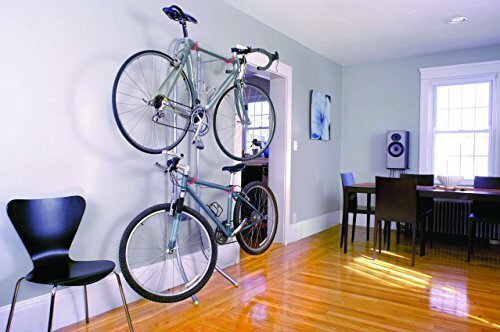 A ceiling to floor rack is a pole which clamps between the ceiling and the floor and are also a good option if you’re in need of a 2-bike wall mount. 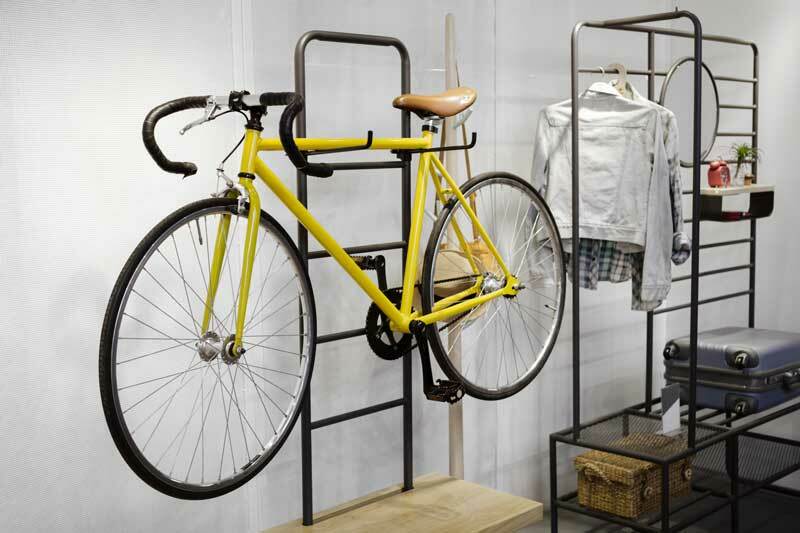 As its name suggests, wall leaning racks act as an indoor bike stand that leans against the wall for support. They are not very secure however and not a preferred choice. 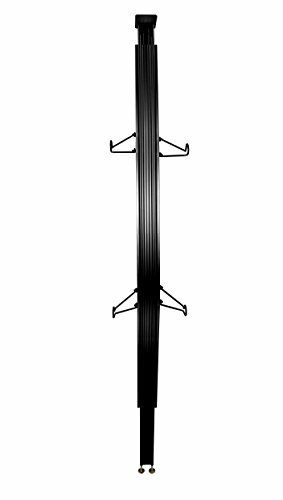 Similar to the ceiling to floor rack, however a freestanding bike rack simply stands on its own accord due to the use of a weighted base. There are a couple of options when it comes to a free-standing bike rack. You can use a basic bike storage stand (and store your bike horizontally) or a “bike tree” (for bike hanging vertically). With a bike tree you basically you just hang your bike off it, so the bike is off the ground. Although again not an ideal choice as the base tends to require a bit of space. Available Space: obviously you’re reading this article because you’re short on space, but where? Do you have no floor space but heaps of wall space? Or not much wall space not plenty of space depth wise? Or perhaps the only space you have is below the ceiling? Once you know where you do have available space, you’ll be able to choose the appropriate type of indoor bike storage. Weight of your bike: Each bike storage solution has a weight limit that it can hold. Be sure to check the weight of your bike before purchasing any storage solution. Permanent or Non-Permanent Solution: The best space savers are one of the permanent fixtures, however, this is not always an option. For those with plenty of wall space, a horizontal bicycle wall mount rack, such as this one from Ibera is an excellent choice. 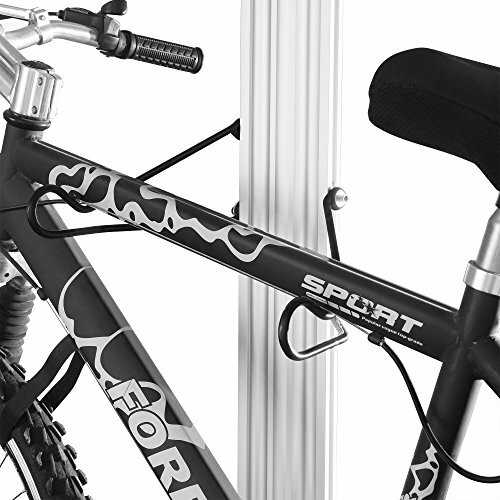 This bike wall storage rack is sturdy, and durable being made from aluminium and with the capacity to hold up to 39.6 pounds, this rack can store any bike. 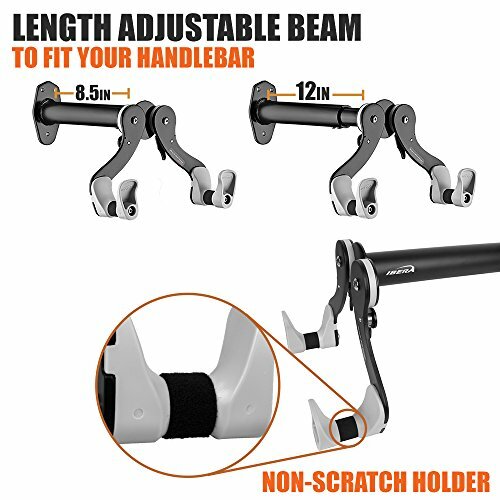 The double arm hanger features padded ABS arms to ensure your bike is held securely and to avoid paint damage to your bike. It is also adjustable to fit narrow or wide handlebars. The Ibera bicycle wall hanger comes with all the hardware you need to adequately mount it to the wall. The kit even includes Velcro wheel straps to hold your wheels in place whilst hanging and preventing any unwanted swinging. At a relatively inexpensive price, this indoor bike rack is an easy choice for anyone wanting to hang their bike horizontally. Read more reviews and check the price here. Another great choice for indoor bike racks, is this horizontal hanging bike rack from Five Flower. Designed to hold a maximum weight of 68 lbs, this rack will hold the heaviest of bikes including road bikes. The highlight of this bike storage rack though is its folding feature. When not in use, simply fold the handle up and out of the way. This is a heavy-duty bike storage rack, constructed from steel and also features a rubber covering on the handles to avoid bike paint damage. Whilst a little pricier than some of the other bike storage racks in these reviews, if you have an exceptionally heavy bike or want the option of having a hanging bike rack that you can fold out of the way when not in use, this one from Fiver Flower is worth considering. 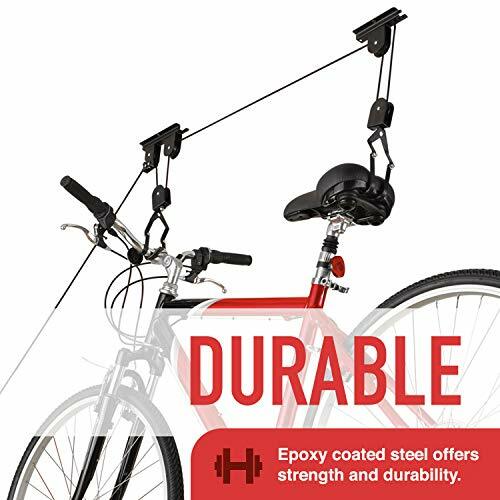 For such a little hook, these Impresa bike storage hooks are exceptionally strong, having the strength to be able to hold up to 100lbs each! 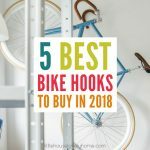 These bicycle storage hooks come in a pack of 4 so you can hang either multiple bikes or use the remaining hooks to use to store other things around the home. You can screw these hooks into the wall or ceiling so you have the choice between vertical wall mounted bike storage or bike ceiling storage. Made from galvanised steel, these hooks to hang bikes are heavy duty and with a long enough thread to allow for a half-inch of sheetrock on top of a stud. The hooks are covered with a soft non slip coating to prevent scratches or paint damage to your bike. 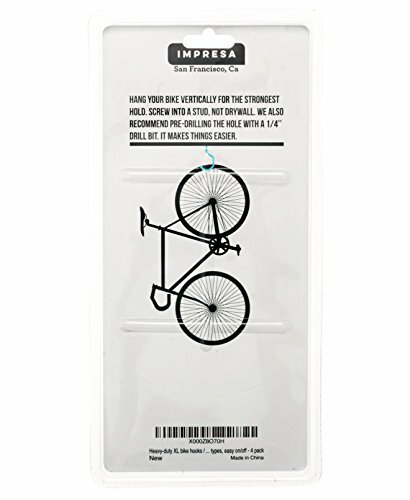 Suitable for all sorts of bikes, these hanging bike hooks by Impresa are a cheap and easy way to store your bicycle up off the ground. 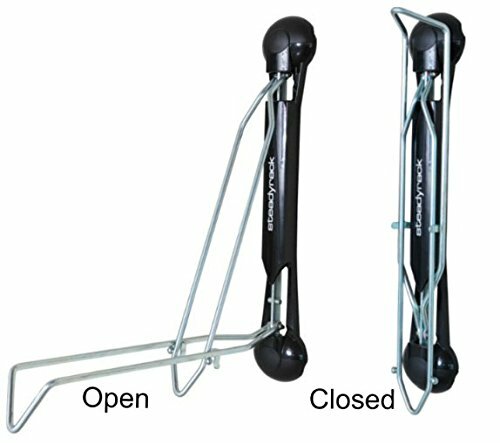 Another good option for a vertical bicycle hanger is the Tornado large J hook. 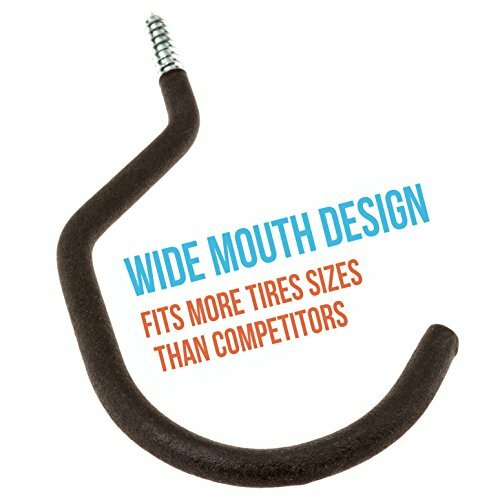 This is a no fuss solution, which has a maximum weight holding capacity of 40lbs, enough for most bikes. A heavy-duty hook, with a rubber coating, this vertical bike rack for home has an extended length which helps distributes the weight better. The rubber coating helps secure the grip as well as preventing scratches and damage to the paintwork of the bike. This is a simple and easy to install home bike rack and well worth considering if you’re looking for a no-fuss solution for hanging bike storage (more bike hooks here). 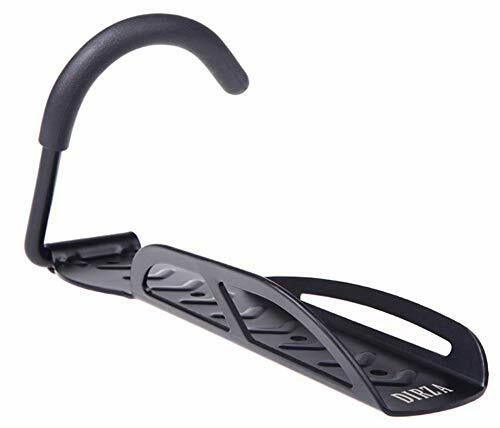 If you’re needing to hang your bike vertically, but after something a little more secure than the previous options, you’re going to want to consider something like the Dirza bike rack. This is somewhat like the previous options but with the addition of a backing plate, which allows you to hang your bike more securely with less movement. This is a heavy-duty home and apartment bike rack to ensure the hook won’t bend. This wall mounted bike stand can hold a weight of up to 65 lbs which will without a doubt hold any bike you may own now or within the future. This bicycle storage rack is strong enough to hold an MTB, road bike as well as any other bicycle. The hook itself features a rubber cover to prevent slippages as well as any scratches to the bike. The backing plate where the front tyre is placed has a non slip stripe for added safety. Backed by a lifetime guarantee, you can purchase these bike racks for apartments and small homes with peace of mind, knowing it will last a life time. 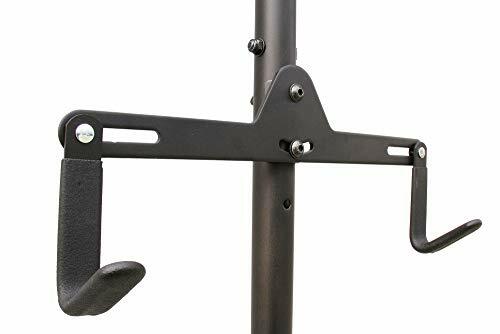 The most popular and highest rated space saving bike rack in these reviews, this vertical wall mount bike rack from Steadyrack will have your bike well secured and stored away with ease. This home bicycle rack can hold a range of bikes including road, hybrid and select mountain bikes, basically most bikes up to a weight limit of 77 lbs. The unique side to side swivel mechanism makes it super convenient, as you can easily store multiple bikes side by side, or among other wall mounted storage units. Another feature of this compact bike rack is just how easy it is to load the bike onto the rack. Simply roll the front tire up and into the rack without ever having to lift the bike off the ground. This is perfect if your storing kids bikes as they can do it themselves with ease. And when this easy bike rack is not in use, simply fold it away, so it sits flat up against the wall. Constructed from a durable steel frame and with UV treated plastic this bike rack is suited to both indoors and outdoors. If you have no floor space and no wall space, then you’re going to have to consider a bicycle ceiling storage system like this hoist by Racor. 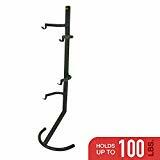 This indoor bike rack for apartment or small home by Racor is super easy and safe to use. 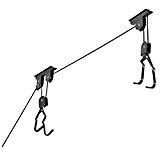 In fact using a pulley system like this reduces the bikes weight by around 8 times! Its super easy to use too. Simply latch the hooks onto the seat and handlebars and pull the rope. Once you’re ready to retrieve your bike, simply lower it to the ground. The pulley has a locking mechanism too which keeps the bike securely in place until its time to be reduced. This is a well-constructed indoor bicycle rack which is made from solid steel and coated with epoxy to ensure strength and durability. It is also completely adjustable being suited to ceilings with heights of up to 12 feet. 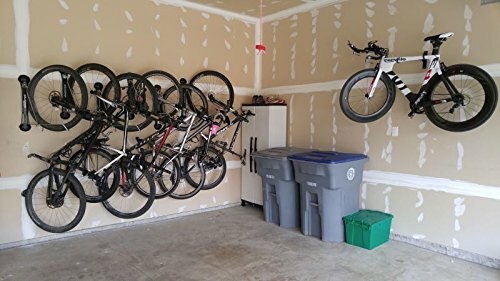 With the ability to hold up a bike up to 50 lbs, you’ll be able to store the heaviest of bikes not on the floor, or the wall but hanging from the ceiling making the absolute best use of space possible. If you’re in a rental place or looking for a non-permanent solution, a floor to ceiling bike indoor stand is a great option, like this one by RAD Cycle Products. 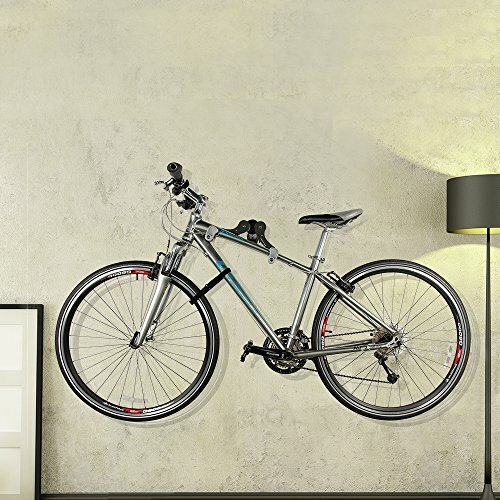 This is an adjustable aluminium indoor bicycle stand which can fit ceilings with a height of 7 to 11 feet high. To avoid damage to the ceiling, this indoor bike mount has is a top plate which also aids in ensuring the rack is securely held in place. This ceiling to floor stand can adequately store 2 bikes. 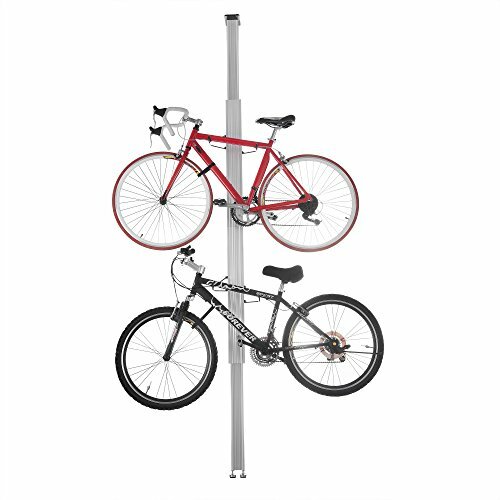 The 2-bike wall rack has vinyl coats arms which not only securely holds the bikes in place, but the vinyl coating also ensures there is no damage to the bike’s paintwork. The arms can also be adjusted up or down so that bikes of various sizes can be stored. The double bike wall rack also comes with hook and loop straps to secure the front wheel to the bike frame, which ensures the bike doesn’t swing whilst on the stand. Another floor to ceiling stand option very similar to the RAD Cycle one is this one by Gear Up. It has may of the same great features as the RAD Cycle in that it is adjustable for ceiling with a height of 7 to 11 feet high and can hold bikes with a combined weight of 200 lbs. However where the Gear Up differs, is that it has the capacity to hold up to 4 bikes! Great for families who all have bikes yet have nowhere to store them. The inside bike stand comes ready to accommodate 2 bikes, however in order to store more bikes you will need to purchase the additional Add-a-Bike kit. Like the RAD Cycle, this multi bike storage rack includes a padded top plate to avoid damage to the ceiling, the storage arms are adjustable and includes Velcro straps to stabilise the front wheels of the bike whilst in storage. For the bike riding family who lives in a small apartment or home, you can’t go past the Gear Up stand. A simple, non-permanent solution for bike storage is this stand from Delta Cycle which you simply lean again a wall. This freestanding bike storage rack has the capacity to store 2 bikes with a combined weight of 80 lbs. 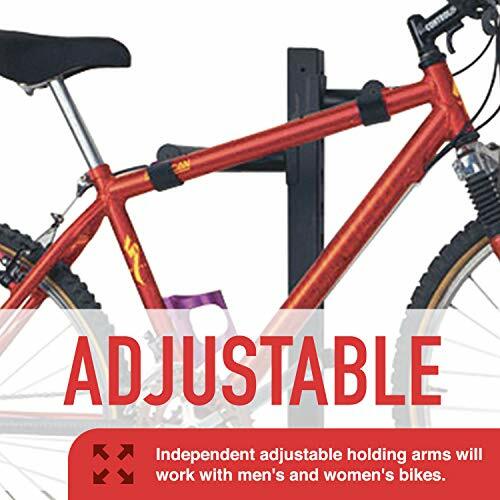 To allow for different sized bikes the storage arms are adjustable and are rubber to avoid any damage to your bike. The frame itself coated with a premium silver powder coating and has rubber bumpers to protect the wall from marks. 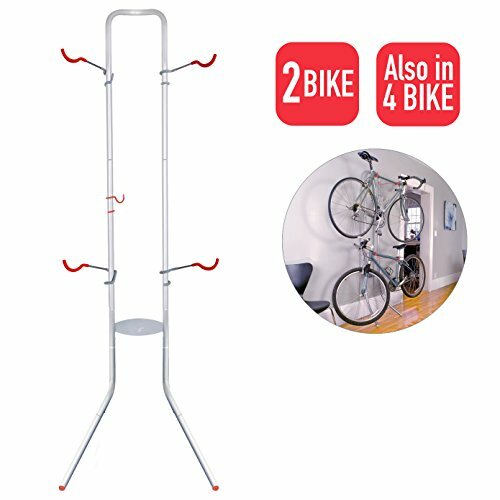 Whilst a great, simple and easy bike storage solution, just note that with this freestanding bike rack for 2 bikes, you will need both wall space and floor space around the base to accommodate this bike stand. The Racor stand is another wall leaning rack but comes in either a 2 or 4 bike storage capacity. 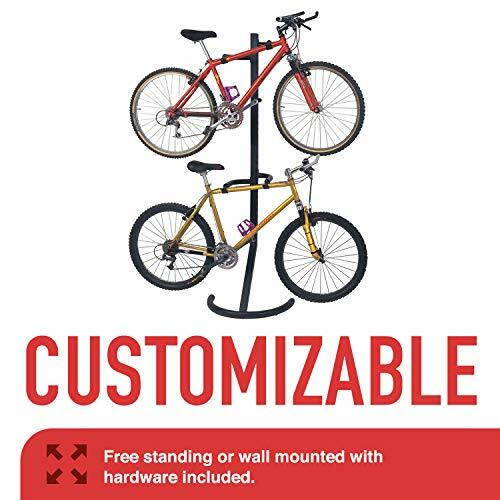 This freestanding bike storage is constructed from heavy duty steel with an epoxy finish and comes with all the similar features of the previous bike racks, including vinyl coated and rubber skids to protect both the bike and wall and floor and has adjustable arms to accommodate bikes of various sizes. The 2-bike storage rack has the ability to hold bikes with a combined weight of 100 lbs, whilst the 4-bike storage stand can hold bikes with a combined weight of 160 lbs. 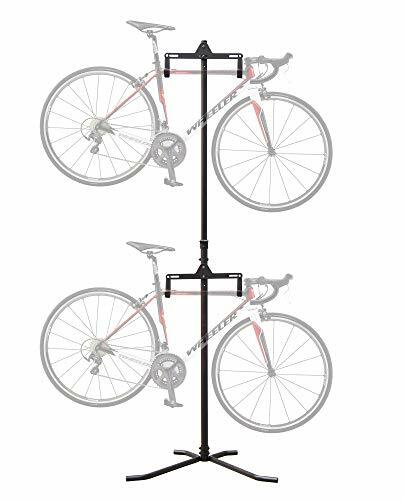 This bike stand by Cycling Deal is a true freestanding bike stand in that it requires no fixing (neither permanent or non-permanent) to walls or ceiling. With a powder coated light steel frame, this bike floor stand has the capacity to hold 2 bikes with a combined weight of 110 lbs. Like all good bike stands, the storage arms are adjustable, so it has the capacity to hold bikes of all different shapes and sizes. The beauty of this bike stand is that with no requirement for a wall for support, you can keep this bike stand absolutely anywhere you like. This stand also comes with a 2-year warranty. Hi, I'm Emma. Together with my husband and two boys, I downsized to an 860 sqft home. I love to share organization tips, space-saving ideas and practical advice for living small with kids. Join me as I turn my little house into a lovely family home and attempt to retain my sanity. Click here to read how downsizing allowed us to become debt-free.